There are a lot of early childhood educators and early years teachers that use child portfolios as part of their documentation. It can be a time consuming process and many are now turning to apps and monthly computer program subscriptions with the aim of making portfolio records more efficient for both educator and parent and to also cut down on printing costs. 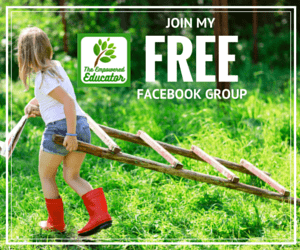 I’m going to be very honest with you – I’m not a fan of most of the apps and digital programs out there currently for educators. There are many reasons but the main one is that although they are meant to save time I found when I tried a few out I was actually doubling up on work and was in fact spending way to much time trying to actually understand how to use the suckers! I was disappearing down a black hole just to do the simplest of documentation or parent communication tasks. That’s why I decided to create my own simpler version! Sometimes I think we as early childhood educators fall into the trap of making things more difficult, expensive and time consuming than they need to be even though we are searching for a better way to do things! However, I know many educators love using the apps, they don’t mind paying for the ongoing access and it has saved them time and that’s awesome. You probably will want to stop reading anymore of this post if that is you as I’m going to be sharing an alternative you can do yourself with no cost involved yet still keep everything ‘digital’. You might like to have a read of my article on whether portfolios are effective and necessary here though before you go! But for those educators who have contacted me about how they can create simple portfolios as a way of documenting your assessments and the children’s progress towards EYLF outcomes yet also keep them available digitally on the computer or online without paying for apps and other services I thought I would share the system I have been using for the past few years. I believe it could also work for you with a few individual tweaks no matter whether you work in a centre or home based care service. 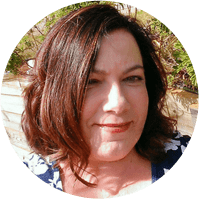 As usual, I’ll keep it pretty simple because regular readers know that’s how I like to share – no point making something more difficult than it needs to be so let’s break it down right now! 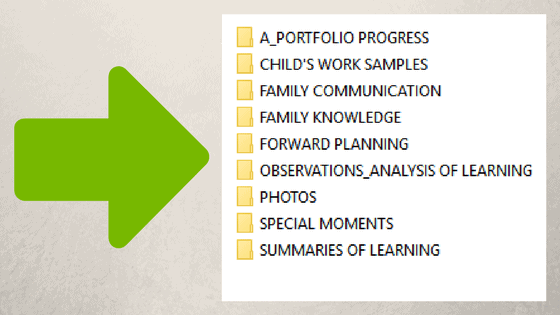 How to create your own USEFUL online child portfolios documentation system! 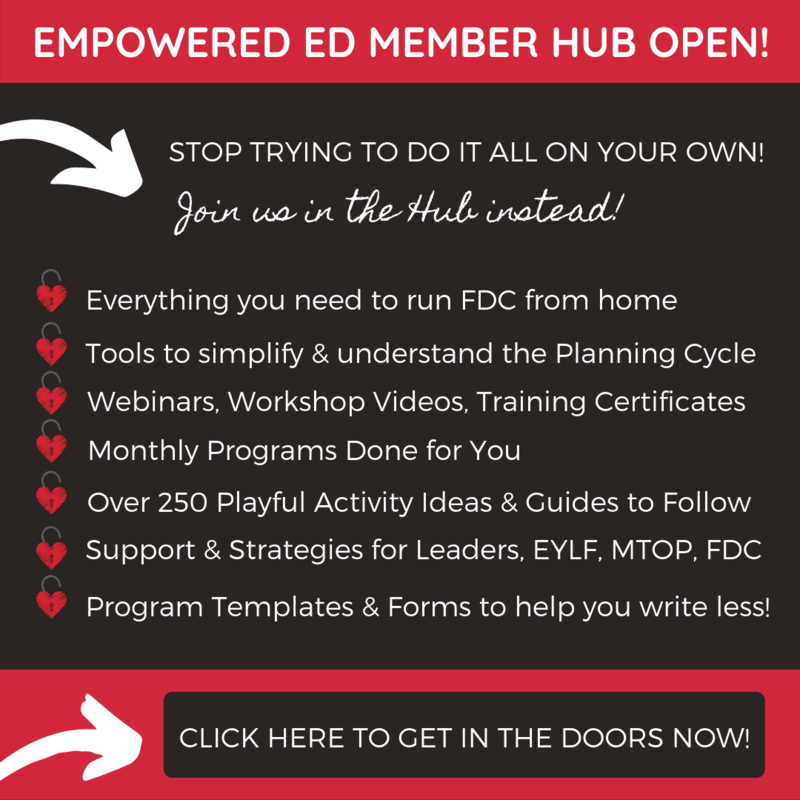 Let’s take that pressure off before you even begin – forget about the fancy templates, making it pretty and recording absolutely every activity the child takes part in and think more about what significant and meaningful moments you want to share in this story of the child’s learning journey and why that speaks to you. You also need to decide if you want your portfolio to simply be a family communication tool and record of the child’s year in your early years service or whether your aim is for the portfolio to collect all of your assessment methods together to share an overall picture of the child’s learning journey and progress. I suggest if you are spending precious time on portfolios you make sure they are ticking many, many boxes for you so you might want to consider other options for simple parent communication and end of year keepsakes. 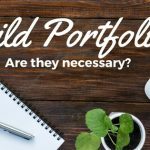 You can compile a portfolio that meets both educator and family needs – you just need to think carefully about what you will include before you start. Start with the basics! Include just the essentials that you need collect to meet the steps of the planning cycle and regulations. Worry about anything else later if you have some spare time (which let’s face it you won’t – you barely have time to do this much!!) The information and assessments outlined below are what I would aim toward including if you want to show a clear summary and story of each child’s learning. How you collect that is up to you! Child observations & Analysis of Learning – Using whatever template or method you currently use which might be learning stories, checklists, photo collages, running records, anecdotal records and many more – use what works for you. 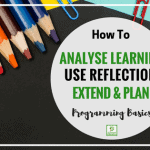 It is not enough to just include observations though – they don’t mean a whole lot and are essentially a waste of your time if you don’t also provide an analysis of the learning that took place. You need to reflect upon this before you can even think about how to further support and plan for that child’s needs. It also makes your forward planning step a whole lot simpler! Read more about observations and analysis of learning in this article (you can also download a free factsheet). 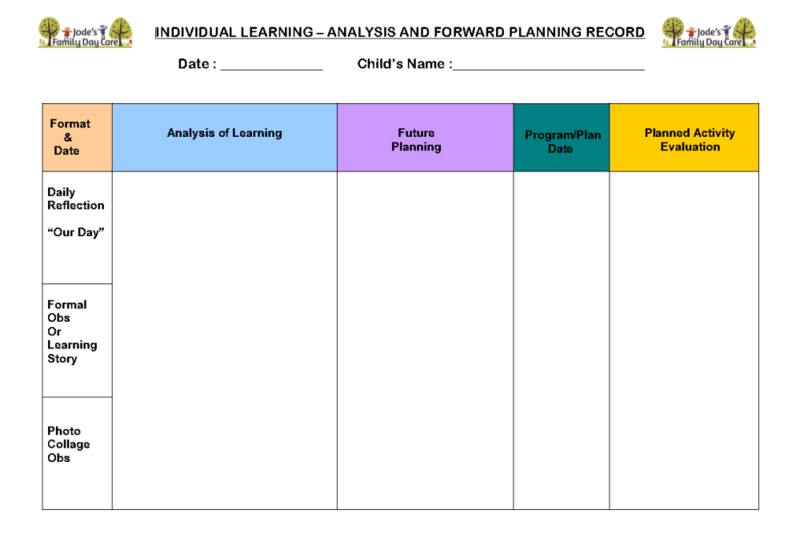 Forward Planning Activities – I use my forward planning form that outlines the observation, date, analysis of learning, the extension activity that was planned and a quick summary of what happened. It makes it easy to show evidence of a clear commitment and links to ongoing documentation of a child’s progress on their individual journey toward a range of learning outcomes. 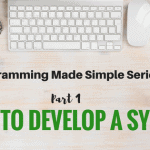 If you want to know more about using this system you can read about it in this post. Some educators prefer to include this information on their initial observation template -whatever works best for you but make sure you have in place a system that is easy for you to follow and that you understand as a step by step process. You also want to be able to show evidence of these clear links from an observation to the analysis of the learning that took place to your reflection on how to next support the child and what you planned to meet this goal. I keep it all on the one form because I know how to easily find the whole process linked together when I need to! Special Moments – this might be photo collages or a story about something the child did as part of a group or individual activity that I as an educator felt was special and worth documenting to share. I would include a few lines of text that is easily understandable by a parent or carer to highlight and explain the learning outcome (no numbers – keep it simple!) and why it was special and important to the child. For Australian educators why not consider using the language of the EYLF to explain the learning rather than using outcome and standards numbers which a re confusing to parents. Samples of Artwork/Construction/Projects/Craft – Something I really don’t like about the traditional scrapbook type hard copy portfolios is that often children are denied the opportunity to take home their artwork because educators want to stick it in ‘their book’. This takes away so many opportunities for the child to share. Although it is important to keep records of the children’s work as a means to convey the learning that has taken place don’t fall into the trap of feeling you need to include everything! Digital portfolios make it easy to keep a record of their work and progress throughout the year while not actually keeping the child from taking THEIR important work home. You also don’t have to be limited to just craft projects and art. You might take photos of that block construction she worked on all morning or the excursion to the retirement home where he read stories with the lady in the chair by the garden. 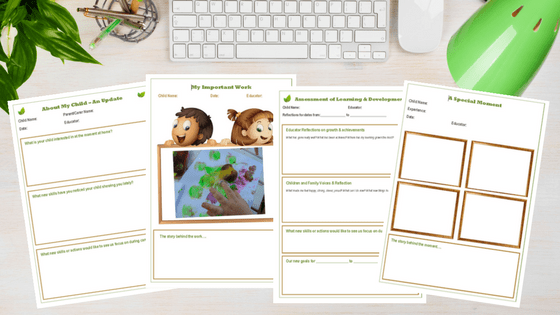 These aren’t moments that you felt you needed to write up as an observation but you still feel important to record and preserve in some way to show part of that child’s learning journey and progress toward learning outcomes throughout the year. Create a simple page in Word or Powerpoint or your favourite phone photo app and then add photos of the samples and a short description of why you wanted to include them. Save. That’s it! More about how to include these in the portfolio soon. A Summary of Learning – First decide if you will be sharing your portfolios on a half yearly or just annual basis. 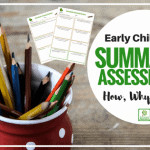 If you want to share regularly with parents and carers throughout the year you might decide to include summative assessments. I know that many educators are confused by this term but it really is quite simple. Perhaps try thinking of summative assessment simply as a way of bringing all of your documentation together (including obs, photos, special moments, family input and the children’s creative work) and using it to tell a story about the child’s progress so far toward certain learning outcomes and goals. Really you are just using everything you have so far documented and analysed individually to now ‘sum up’ overall progress . In Australia we use the Early Years Learning Framework (EYLF) to help us assess that progress in relation to the learning outcomes.Some educators choose to use a checklist to show this easily, others prefer to write more in depth analysis and use templates to guide them. 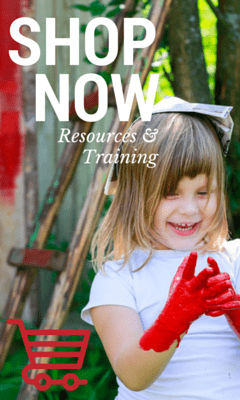 As well as including the summary of learning you also want to share some of the new goals and ways you plan to further support this child’s learning and development as you move forward. Family Information and Input – Use a simple form to record and bring together family feedback, important information and engagement that occurs throughout the year and is significant to the child’s progress and how you have planned and supported taking this knowledge into account. Again, keep it simple, no need for a fancy template – just draw up a box in a word document and add to it as you need to. I’ll show you how to bring all these individual records and assessments together next so don’t stress about it all not being in the one place! How to bring it all together to form your child portfolios. So how do you bring all of the work above into the one place to form a learning journal or child portfolio? It really is so simple but will also depend on what level of assessment and information you want to include in your portfolio. You will also need some basic computer skills and to have access to a laptop or desktop computer to first set up your portfolio files. I’ll also give you a tip for being able to access your portfolio at any time via your tablet or mobile devices. These are the steps I would suggest (and exactly how I have used digital portfolios with my family day care parents and carers) …. Create a new folder in your computer file documents and name it something relevant like Child Portfolios or similar. Now each time you write an observation, complete a summary of learning, connect with a forward planning form, record a special moment etc you can save the document to the relevant folder and it begins to build a comprehensive portfolio that isn’t taking you a huge amount of time – these are all records you are probably already keeping as an early childhood educator – this way you are just making sure they are all in the one place for every individual child and there is no need to waste time, ink and paper printing unless you want to display something for some reason. If you are still working with hard copy forms and templates or perhaps using a mind map system or whiteboard for some of your documentation and communication then you can still keep your portfolio digital by taking a few minutes to snap a photo of the work or scanning the form and then saving to the relevant folder you have set up on your computer. That way if paper goes missing you will still have all the evidence and documentation you need to easily explore and share the progress of each child’s learning journey with you. If you like to use a tablet you can easily save your ‘child portfolio’ main folder to a cloud based service like Dropbox or similar to then access your files whenever you need them. You can of course also save your documentation, templates and anything else you regularly work on in other folders that make sense to your system on your computer but I always made sure to also save in the child’s portfolio files so it was easy to find. I’ve included a short video below if you would like to see me briefly walk you through setting up your folders and some of the forms I have used. Remember though that this is going to be your system to modify and tweak until it suits your specific needs – you might include less or more than me, you certainly don’t won’t to double up on work you are already doing so perhaps write down what forms of documentation and assessment you are using at the moment and what you then want to include in your portfolio. Discuss with your team members and leaders if you are working with others rather than on your own with documentation requirements. To help you keep organised and not feel overwhelmed I do recommend that you have a subfolder set up for each individual child with a record/contents form that helps to keep you updated on the progress of the information being included in that child’s portfolio. This is something you can update and check regularly to give you an overall snapshot of where you are at when working in that folder. I show you what I mean in the video below. How to share your child portfolios with others. 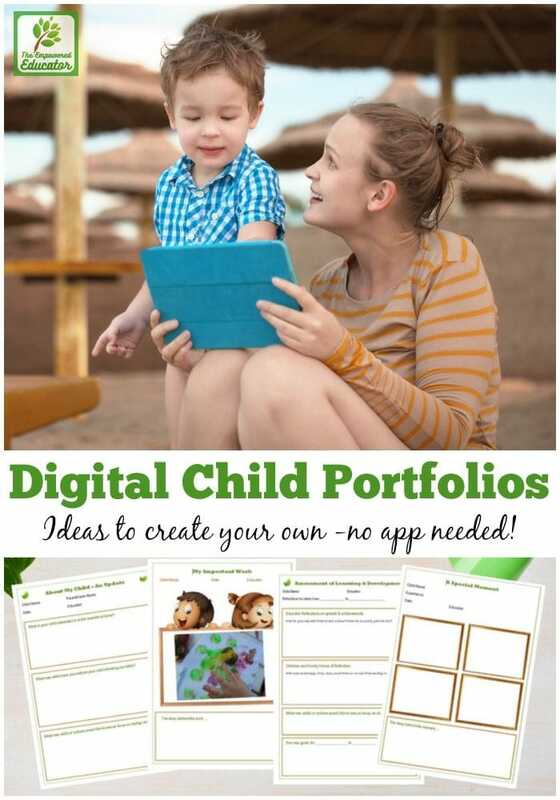 I know some of the appeal of apps and computer programs is that you can share information easily with parents and others as required but you can also do this with your own digital portfolio information. I have done it for quite a few years now without it costing me a cent! So if you want to regularly share some of the information you are including in your child portfolio – including family communication forms all you need to do is use a cloud based service like Dropbox (you can open a basic account and it will cost you nothing – this is all you should need). Then you can create a new folder for each child and simply upload or drag and drop the information (from your own computer folders) that you want to share with the parent into this folder. 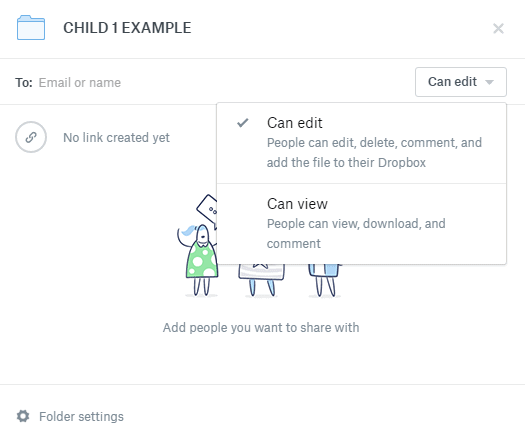 With dropbox you can send an invite to the relevant parent/carer/team member to share the child’s portfolio folder with you. You simply add their email address as you see in the box below and tick what sort of access you want them to have. Anything you add to that folder will show up on their home computer (or mobile device with the dropbox app) in their child’s folder as it syncs. They will need to join Dropbox but you will be surprised at how many families already have it installed on their system and I have only ever had one or 2 parents who preferred not to sign up and share the folder with me. In those cases you can simply send a link through via email or text at the end of your day to the parent – they don’t need to have access to a Dropbox account, they simply click on the link in a web browser and will see what information or form you have linked to. This saved me so much time as I used to email all of my parent communication forms and letters – this alternative way I simply dropped it in each child’s dropbox folder at the end of each day and parents opened the folder on their own computer or device at a time when it suited them! Saving relevant folders and photos to a USB stick then handing out to parents at the end of the year. Creating a powerpoint slide show or video to show and distribute to parents. Emailing a link to parents so they can access their child’s portfolio of learning via your dropbox (or other cloud based service that you might use). I particularly like the dropbox option of sharing a folder with parents because it allows you to take out only what you feel is relevant to share with parents throughout the year from your main portfolio folders. This saves time and also allows greater flexibility and an easy way for parents and carers to give quick feedback as well. 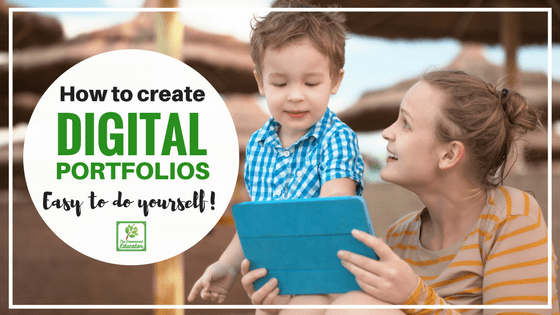 I hope this article has given you a few ideas to consider if you are wanting to make the change to paperless portfolios and learning journals – don’t forget you can always print if you need to or want to share something hands on with the children or family. Download your FREE print friendly PDF factsheet of all the main points in this article to refer back to at anytime – simply click on the picture below! If you use Pinterest why not pin the image below so you always know where to find this information again! « Make your own chalk paint! So glad you found it helpful Julie!